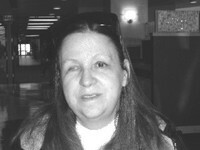 Gerri Lynn Ellerman passed away at her home on August 14, 2005. Born on Random Acts of Kindness Day, Feb.17, 1951 in SLC to G. Clinton and Dixie Ellerman, Gerri graduated from Hillcrest High School, then beauty college and after years of working in retail including 25 years at Kmart, graduated in May 2005 from Salt Lake Community College in psychology. Her college career began after becoming blind from diabetes - her courage and determination has inspired many and touched us all. She was due to begin the U of U this fall to continue her education and fulfill her goal of becoming an advocate for the disabled. Gerri personified her birth date extending kindness and generosity when least expected. She had many talents including quilting, crocheting, and crafts. Her quick comebacks and sense of humor exemplified her lively personality. She is survived by her pride and joy, son Andy Ellerman, his wife Jacquee, her father, sisters Judy Jensen, Dixie (Dale) Sargent, brother Douglas, and 11 nieces and nephews. Published in the Deseret News on 8/19/2005. Geri and I were friends at Midvale Junior High. She was a HUGE Beatles fan and we had fun making little scrapbooks about the Beatles. I kept one that she made for me for years. WE used to have a group of us that all hung aroung together, had alot of fun. She was really sweet. Didn't know she had passed. She really was a Beatles fan!!! God Bless her. Wow. It's amazing to see people who are forever young in your memory passing. Gerri and Lynda Gittens actually went to see the Beatles in the 60s. Nobody earned it more, with their amount of devotion to the group. I remember going to the Science Fair in the 9th grade and Gerri catching a ride home with us. She had to sit on my project, which was full of tacks. She complained somewhat about that, but took it all in good humor. I mainly remember her in conjunction with Denise Dahn, Lynda Gittens, Ewelleen Hobbs, Ola Despain, and Velma. She had heart, and it's to her credit that she was trying to help the disabled before her passing. If it's possible, she'll be in the same section of the afterlife as John Lennon. As I was thinking about the 50 year reunion, I took the time to open up my yearbook for 1969 and look through it. I was somewhat overcome with memories. We all were so young. I began to read some of the comments that were written throughout the book and found myself so thankful that I had so many friends that would say such nice things. ( probably knowing they would never see me again, ha ha). More curiousity took hold and I pulled out the book for 1968. I don't remember ever really looking at who wrote in my book that year, but there on the last page in the back of the book was the most tender, kind and loving entry from Gerri to me. I am without words to convey how that has affected me. I had no idea how she felt. I do remember her as such a sweat girl with a tender heart and a reserved nature. So I am here now looking for her information and sad to see that she has passed so long ago. It looks like she has left a wonderful family behind that I am sure miss her very much. I am surching my memory in hopes to find moments that we shared at school. I remember a few, but mostly I remember her face and her smile.